PoE (Power over Ethernet) has been thrown around for over a decade, serving as an optimal choice to enhance network agility and scalability. It has earned a universal acceptance in applications including video surveillance system, IP camera, VoIP phone and wireless access point. PoE switch, PoE injector and PoE splitter are common methods to get PoE technology into your network. What makes the difference of PoE splitter vs. injector vs. switch? Which to implement as in different situations? We’re going to shed some lights on those issues. 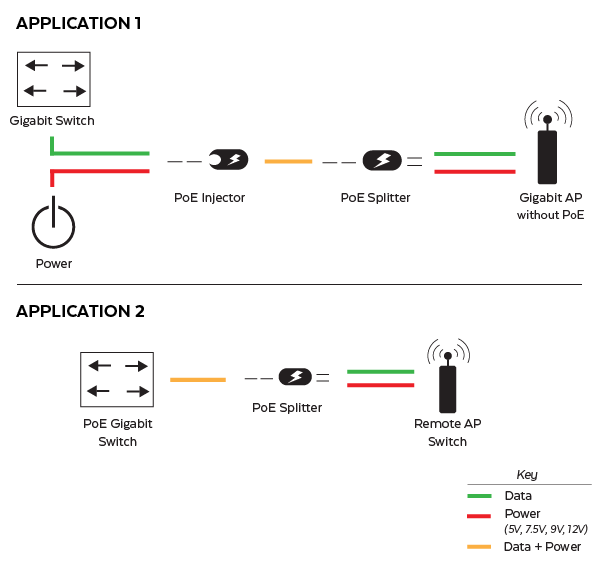 PoE Splitter vs. Injector vs. Switch: What Are They? As you can tell, picking the right equipment is a crucial first step to building any network. PoE equipment can be particularly complicated, so here we’re going to cover the basics to PoE switch, PoE injector and PoE splitter, trying to clear out the confusions concerning this. A PoE injector, or midspan, introduces or injects power onto an Ethernet cable (Cat5e and Cat6). The injector adds power to data that is coming from a non-PoE switch or “endspan” (IP cameras, wireless access points and LED lighting) It has an external power supply. PoE injector is perfect for low power devices that needs to be set up in locations where a power outlet is unavailable. It thus enables more flexibility by opening the door to installing devices in hard-to-reach areas, with a minimal impact on existing structures and budget. If you happen to have a device that is not PoE compatible, or a mixture of compatible and non-compatible devices – this is the common use case for a PoE splitter. PoE splitters combine PoE networking cable and setups with traditional technologies. They deliver data and DC power through separate connections. They can also be used to bring a 48V DC (PoE) current down to play nice with 5, 12 or 24V DC jacks. PoE switch is considered one of the smartest ways to invest in your network. As business are rolling out for expansion and homes getting smarter, PoE switch serve as a vital point to efficiently develop your network in the right direction. Like standard network switch, PoE switch also comes into different port configuration and feature sets. The prominent advantage is that the ports can deliver power and data simultaneously. High performance and density PoE switch offers endless expandability and scalability for escalating enterprise business networks. The equipment a PoE switch can connect including but not limit to computer terminals and printers, servers, firewall and monitoring systems, VoIP phones and WAPs. Besides, PoE switch is now equally available for home use – providing a more substantial backbone to home networks, creating connections to applications like AppleTV, ChromeCast, Sonos, Playstation and etc. Below we’ve explained the features and differences concerning PoE switch, PoE injector and PoE splitter. You may have figure it out that your final choice actually in close relate to your network requests. If you’re planning a network with a mix of PoE-enabled and PoE non compatible devices, then PoE splitter is the one and only option. Then what about a network demands exclusively PoE compatible devices – in which case both PoE injector and PoE switch are valid options. If you decide to install a PoE device without a PoE switch or if the devices are too far from the PoE switch and you would like to avoid running wires, you can power it using a PoE injector. PoE injectors works well with existing wiring and is small and lightweight in design for easy mounting. A PoE injector can only power one device at a time, so for a few devices individual injectors work fine, but once devices start racking up in the numbers, having so many individual injectors gets less desirable. For networks that demands a large quantity or high quality PoE enabled devices, it will be more economical to go for a PoE switch since it can power more than one PoE compatible device. Some smart/managed PoE switch even can reboot a misbehaving device from anywhere in the world. Efficiency and management of power are driving PoE industry. Fully aware the market demand and customer preference, FS develops IEEE 802.3af/at compliant PoE switches with 8, 24 or 48 ports for enterprise business and home alike. Here is a mode comparison of FS PoE switches. Your best bet might be to identify the number of devices you desire to connect to your PoE switch. As the cost of PoE switch are much more affordable, the number of public and private sector PoE installations is increasing. PoE switch also facilitate installation in harsh and/or extreme environments, the application of which is bound to soar. If you have any problems concerning PoE splitter vs. injector vs. switch or other PoE equipment, feel free to contact tech@fs.com or sales@fs.com. PoE Switch VS. PoE+ Switch, Which Will You Choose? 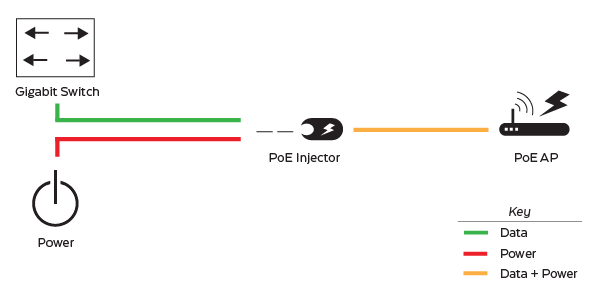 What Is PoE Injector And How to Use It? This entry was posted in Network Switches and tagged poe injector, poe injector vs poe switch, poe splitter, PoE switch, Power over Ethernet on May 25, 2018 by Aria Zhu. 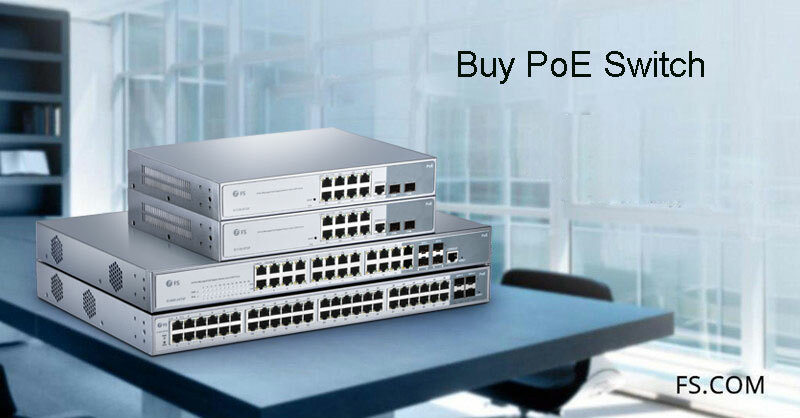 Many people choose to install POE (Power over Ethernet) switches for enterprise or home use. PoE technology is time-saving and money-saving for cable installation by carrying electrical power over network cable. In the market, if you are careful enough you can find some are marked as PoE switch and some are PoE+ switch. What’s the difference between these two switch? Can we use PoE switch vs. PoE+ switch? Find answers in the following article. To answer this question , we have to learn these IEEE802.3af (PoE) and IEEE802.3at (PoE+) standards. IEEE802.3af standard was established in 2003, upgraded to IEEE802.3at in 2009. IEEE802.3af standard supports the network devices that require up to 13 W of electrical power. But it can’t meet the power needs of many devices. Therefore, IEEE802.3at standard was promoted to offer more power for high-power PoE devices, for instance, cameras with high-power IR illuminators, IP telephones, small network printers etc. The big difference between IEEE802.3af and IEEE802.3at is the maximum amount of power they provide over Cat5 cable. 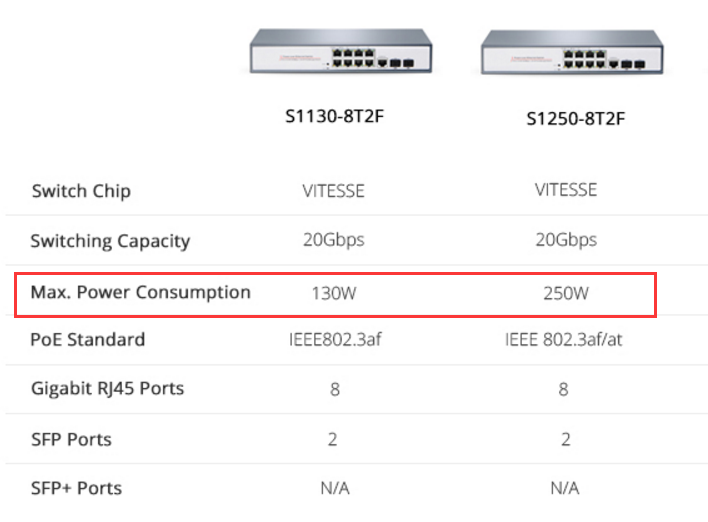 The maximum amount of power for the 802.3af standard is 15.4 W and the maximum for the 802.3at standard is 30 W. PoE switch and PoE+ switch are designed based on different IEEE standards. PoE Switch VS. PoE+ Switch: What’s the Difference? Let’s compare these switches: S1130-8T2F and S1250-8T2F. S1130-8T2F is an 8 port PoE switch with 2 SFP ports. S1250-8T2F is an 8 ports Gigabit PoE+ managed switch with 2 SFP ports. At first glance, these two switches look the same. Actually one is PoE switch and the other is PoE+ switch. Obviously, by comparison of above two types of switches, switching capacity, RJ45 ports and SFP+ ports, all are the same, except max. power consumption. The max. power consumption of S1130-8T2F is 130W while the S1250-8T2F is 250W. Max. power consumption of PoE switch is smaller than that of PoE+ switches. PoE Switch v PoE+ Switch? Which One Should We Choose? Many users may encounter this problem. Should we choose PoE switch or PoE+ switch? PoE network switch is cheaper. But PoE+ switch have some advantages over PoE switch. More electrical power–PoE+ switch can provide 30W, nearly half of the electrical power to powered devices more than PoE switch. Smart power budgeting–PoE+ switch includes scope for power sources and powered devices to communicate with each other to negotiate an allowance of electrical power. 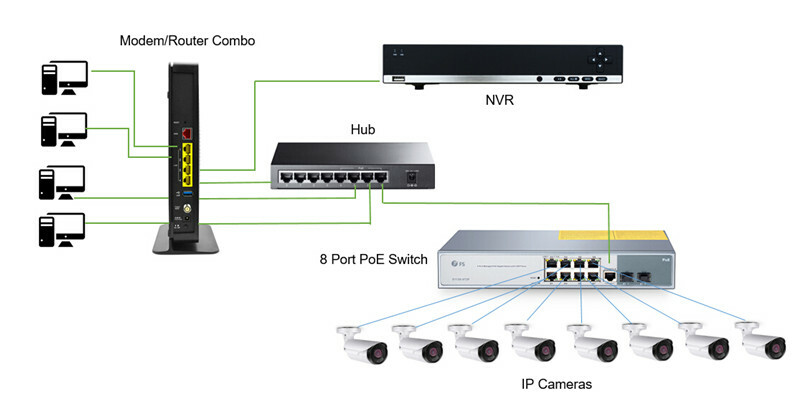 PoE+ switch can support a more complete range of network equipment, including IP cameras with heater/blowers, and multichannel wireless access points. To help you make better decision, I’ll take two types of 24-port switches as an example: S1400-24T4F PoE switch and S1600-24T4F PoE+ switch. S1400-24T4F is a 24-port Gigabit PoE managed switch with 4 SFP ports, 400W. It’s compliant with IEEE 802.3af/at. It’s a good solution for SMB or entry-level enterprise which demands industrial, surveillance, IP Phone, IP Camera or Wireless applications. S1600-24T4F is a 24-port Gigabit PoE+ managed switch with 4 ports, 600W. It’s compliant with IEEE 802.3af/at, supporting the connection to VoIP phones, wireless APs and IP surveillance cameras for intelligent switching and networks growth. S1400-24T4F and S1600-24T4F support both 802.3af/at standards. They can fully allocate IEEE802.3af powered devices, and half allocate the IEEE802.3at powered devices. There aren’t too many differences between the two switches. S1400-24T4F is cheaper and S1600-24T4F provide more electrical power. Well, to choose S1400-24T4F (PoE switch) or S1600-24T4F (PoE+ switch), the decision depends on your needs and budgets. PoE switch is still employed by many users. Can We Connect PoE Access Point with a PoE+ Switch? PoE+ is compatible with PoE. POE+ switches can recognize 802.3af powered devices and enable PoE to them as normal. PoE+ powered devices can also be connected to 802.3af PoE switches, and are supposed to restrict how much power they use accordingly. As the above show, S1400-24T4F PoE switch and S1600-24T4F PoE+ switch are compatible with 802.3af/at standards. So can we connect a PoE access point with a PoE+ switch? The answer is yes. PoE Switch VS. PoE+ Switch: Do you get the difference between them now? Hope this article is helpful. This entry was posted in Data Center Switch and tagged PoE switch, PoE Switch VS. PoE+ Switch, PoE+ Swith on November 25, 2017 by Laura.Yu. Why Not Choose a PoE Switch? The Power over Ethernet (PoE) lets Ethernet cables supply the power for network devices, at the same time as transmitting data in the normal way. Typical PoE users are businesses adding to their network or adding VoIP phones in buildings where new power lines would be expensive or inconvenient. So why not choose a PoE switch? PoE switches give you an easy way to add PoE devices to your network. The plug-and-play switches will automatically detect whether connected devices are PoE or PoE+ and send power accordingly. 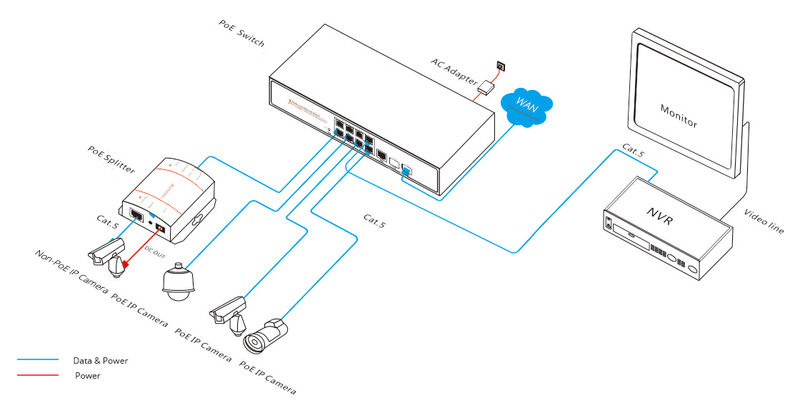 Choose managed PoE switches to control multiple devices from the data center. For simpler operations, choose more economical unmanaged PoE switches is enough. Now, let’s get close to PoE and PoE switches. Power over Ethernet is a technology that lets network cables carry electrical power. For example, a digital security camera normally requires two connections to be made when it is installed. One is a network connection, in order to be able to communicate with video recording and display equipment. Another is a power connection, to deliver the electrical power the camera needs to operate. However, if the camera is POE-enabled, only the network connection needs to be made, as it will receive its electrical power from this cable as well. Currently, there are two standards approved by the IEEE. The first, approved in 2003, is IEEE 802.3af and specifies up to 15.4 watts of direct current (DC) power. The second standard, ratified in 2009 as IEEE 802.3at, is commonly called high power PoE (HPoE) or PoE+ and doubles the power capabilities to 30 watts. Both standards have a maximum distance of 100 meters (328 feet) that is dictated by the distance limitation of Ethernet network cable. The 48VDC voltage used in plain old telephone service (POTS) analog circuits is what is commonly used for today’s PoE systems. A basic PoE-based system usually consists of three main components: power-sourcing equipment (PSE), such as a PoE switch, category network cable and remote-powered devices, which may be an IP camera, IP access panel, IP intercom, VoIP or wireless access point (WAP). PSE is the most critical one among them, which is a device that injects power onto the same network cable that is being used for data. The injector can be a stand-alone single-port or multiport device, or the injector can be built into a network switch, which is called a PoE switch. The second option is more common today due to the convenience of using a single integrated device. 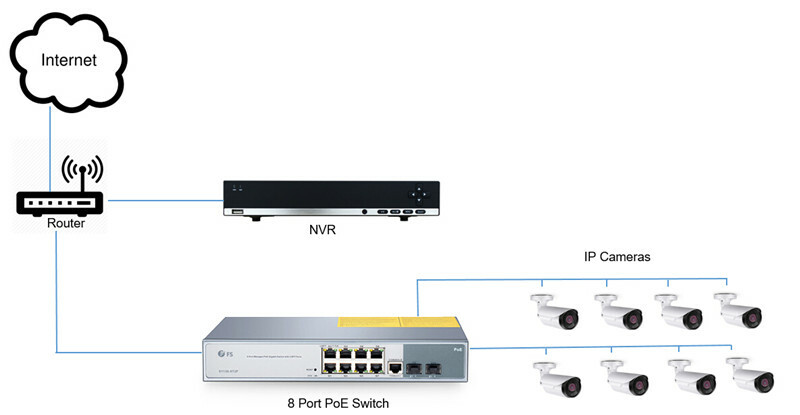 PoE switch is not just handling data transmission, but also serving as the centralized power source for the video surveillance system. Therefore, upgrade your network to PoE is straightforward, and you just need to choose a PoE switch. Following figure is a 8 port PoE switch. How to Choose a PoE Switch? Although PoE is primarily designed as a plug-and-play technology, not all PoE switches are designed to deliver the full demands of maximum PoE on each port. PoE switches are sold at different price points and applications, from low-cost unmanaged edge switches with a few ports, up to complex multi-port rack-mounted units with sophisticated management. It’s easy to make a purchase decision based on the lowest price. However, the cheaper PoE switch will typically have a less robust power supply and may not provide the full power required by PoE endpoints. Therefore, selecting the right PoE switch for a job can be challenging. Following are some simple guidance that might help. Firstly, you should make sure how many ports you need to support your PoE devices. After finding a PoE switch that will provide suitable power conditions on a per-port basis, there is another element to consider—power budget. For example, you bought four cameras to use four cameras, not to use just one or two. Then will the switch you choose provide enough power per port for each camera? Will the switch provide suitable power to all ports at all times? Finally, after considering space in your panel, power demands of one device, power ability of a switch for one port, and powering ability of a switch across all ports, you are prepared to make a decision! The power consumption for PoE switches can add up quickly when there are multiple IP cameras, access control devices, outdoor heater/blowers, etc. The keys to choosing a right PoE switch is to make sure that the network switch can provide the necessary wattage of PoE that will be needed for each device, and that the aggregate wattage necessary to power all devices simultaneously is available. 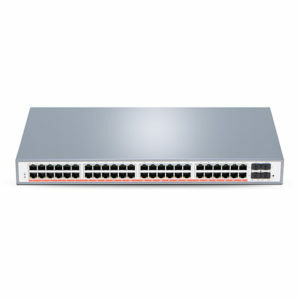 Fiberstore provides PoE switches in a variety of specifications, which may make your trip as comfortable as possible. For more information, please feel free to contact us at sales@fs.com. This entry was posted in Switch & Transceiver and tagged PoE, PoE switch, Power over Ethernet, PSE, VoIP on December 19, 2015 by Alice.Gui.